June 22, 2010. Tags: 2010 midterm elections, Economy, Nikki Haley, SC GOP Gubernatorial runoff, SC politics, Unemployment. Politics, Popular Culture. Comments off. June 8, 2010. Tags: Arkansas run off, CA primary, Carly Fiorina, Meg Whitman, midterm elections, Nikki Haley, NV Primary, primary day, SC Primary, Sen Blanche Lincoln, Sharron Angle, Sue Lowden, Tea Party Patriots, VOTE. Politics, Popular Culture. Comments off. 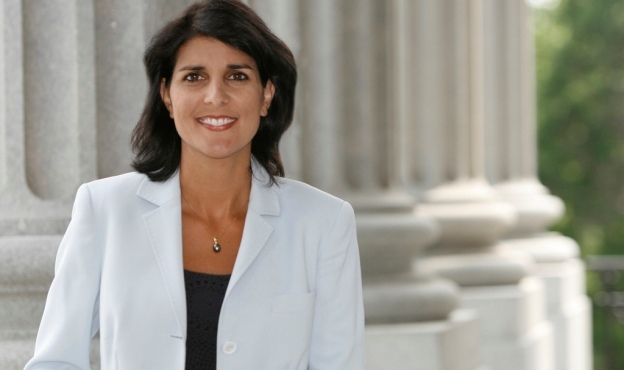 We support Nikki Haley in the SC GOP Gubernatorial race. Nikki has experience and an understanding of what the people are looking for, leadership. Much hoopla has been made of scurrilous accusations of infidelity by first a blogger and now the former Chief of Staff of Andre Bauer, Nikki’s opponent. (What an amazing coinkydink eh?) See Palmetto State Politics blog for full coverage. I don’t know what these two buffoons think they have to gain by smearing this woman except for advancing the cause of Andre Bauer. If they have nothing else to go after her on, like you know, ISSUES, then they should sit down and let the people decide. But we did learn one thing last night, Andre Bauer is a coward and Nikki Haley has guts. And THAT is important when you are looking for leadership, especially in the fiscal situation ALL the states are heading into under the Obama economy. Andre Bauer could not meet Nikki’s eyes in the debate last night when she confronted him directly about the story. It reminded my quite a bit of one debate in the Dem primary in 08 when the late Tim Russert confronted Obama with the ‘race card memo’ his staff had compiled containing ‘incidents of racism’ Team O claimed was displayed by the Clinton campaign. Of course Obama just schmoozed Russert and the cameras, claiming he just wanted to move forward past these ‘incidents’, (then his campaign played the race card again the following week.) Quite Bauer like really. Pathetic. …As Nikki Haley notes, Bauer only fired Marchant after the press refused to pick up the story. Thus we see Andre Bauer’s entire campaign strategy — ignore the issues, ignore the experience, and go straight to calling Nikki Haley a whore. I really and truly hope South Carolina voters will not reward the man for something so disgusting…. Nikki Haley says these smears are just that, lies and smears. I take her at her word. But you know what? If she did have an affair it is IMO absolutely none of our business. My position has not changed on this one iota since the Big Dawg days. I don’t particularly care how my politicans fulfill their inner ids as long as it does not impact governance. That is IMO between themselves, their families and their God. Whether or not Nikki Haley ever had an affair, we know Andre Bauer is a coward and a sleaze ball who would ruin a woman’s reputation behind her back and not have the guts to challenge her to her face. June 3, 2010. Tags: Andre Bauer, Economy, Nikki Haley, SC GOP Gubernatorial primary race, SC GOP primary, SC Governor race, SC Gubernatorial race, Tea Party Patriots. Economy, Politics, Taxes, Unemployment Statistics. Comments off.